It’s that time of year again, holiday music is playing, turkeys are being stuffed and decorations are coming out. Nobody likes a Scrooge, but people do like saving money. So, Applewood Plumbing Heating & Electric has some tips on how to cut costs on your fun festivities that will be sure to keep your holidays merry and bright! Light your home with LED lights! If you’re in the market for more energy efficient lights, then set aside those old incandescent bulbs and upgrade to LED holiday lights. LED’s use 70 percent less energy, all the while being brighter, more eco-friendly and safer. They tend to be cooler than incandescent lights, which reduces the risk of a fire. In addition, they last ten times longer and they have no filaments or glass to break. Just make sure that you aren’t overloading your circuit box. Merry Christmas ya’ filthy animal! Remember when the cat nearly burned down the house in a National Lampoon’s Christmas Vacation? We all love our pets, but they can be difficult this time of year with so many wires enticing them. This can be dangerous for your pets and your wallet. To keep your pets from chewing on the wire, we recommend coating them with a bitter anti-chew cream that should keep your pets away. Also, remember to unplug your lights when you leave your house or go to bed. 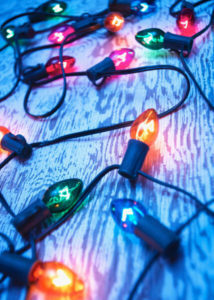 You may also want to avoid twinkling lights or dangling cords, which may tempt your pets. To save costs on your energy bill during the holidays get creative with your decorating. Reflective tinsel, ornaments and menorahs can be just as bright at night as lights. Ribbons, wreaths and garland are also sure to bring oooh’s and ahh’s from your holiday admirers. Oh, bring us a figgy pudding! In order to save time, energy and create some lasting memories, reduce all your baking to a single day. Gather your kids, friends or other holiday companions and create an assembly line to get all your pies, cookies and other edible treats done at one time. Then, you’ll only be increasing power usage for mixers, ovens and refrigerators on one day, rather than throughout the whole month. Happy Holidays from your friends at Applewood!